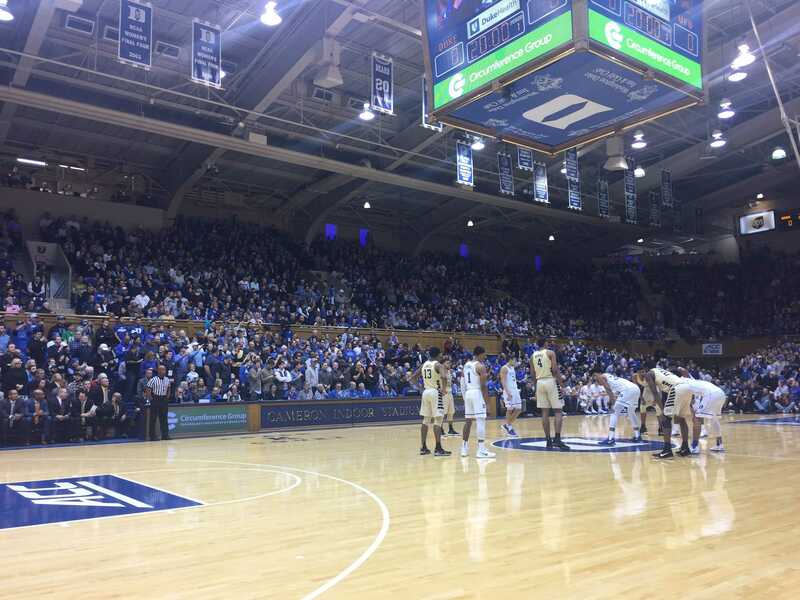 Wake Forest traveled to Duke’s Cameron Indoor Stadium on Saturday, Jan. 13 in search of its first victory in Durham since the days of Tim Duncan. With Duke player Mike Krzyzewski out sick and early losses to Boston College and NC State, a glimmer of hope existed that Wake Forest could perhaps give the Blue Devils their third unanticipated loss in conference play. This hope seemed to slip away midway through the first half, however, as the unequal foul count put the Deacs at too great of a disadvantage, limiting the minutes of both of Wake Forest’s centers, Doral Moore and Olivier Sarr. At least one of the two needed to be on the floor for the game’s entirety to match up with the Duke frontcourt, which rivals any group of big men in the country. And with the pair out for the majority of the first half, the Deacs were unable to contain Duke’s Marvin Bagley III and Wendell Carter Jr.
Because the Deacs were called for twice as many fouls as the Blue Devils in the first half, Duke was able to pull ahead to a comfortable 13 point lead after the game’s first 20 minutes. To Wake Forest’s credit, head coach Danny Manning pushed his team to continue competing, and the Deacs played a relatively even second half with the Blue Devils. Bryant Crawford led the Deacs with 21 points and six assists, complementing Keyshawn Wood’s 15. Woods was not satisfied with the effort the Deacs put forward on Saturday, telling members of the media after the game that the team would need to meet outside of practice to discuss how things could turn around. “We’ve got to come together as a team — figure it out — it’s on us,” Woods said, who finished three of four from beyond the arc. Coach Manning said the Blue Devils were able to play the game they were looking for, proving to be the more aggressive team on Saturday afternoon. Indicative by the free throw differential, Duke was certainly the more aggressive team, attempting 34 shots from the charity stripe, opposed to the Deacs’ nine. Wake Forest’s nine attempts marked the first time since 2000-01 that the Deacs attempted single-digit free throws in consecutive games — a statistic that will need to improve as ACC play progresses. The Deacs will face NC State on Thursday, Jan. 18, looking to win in Raleigh in consecutive years for the first time since winning three straight at PNC Arena in 2001, 2002 and 2003. If the Deacs want to earn their first ACC road victory of the season, they will need to keep both Moore and Sarr out of foul trouble and play more aggressively in order to get more attempts at the free throw line.